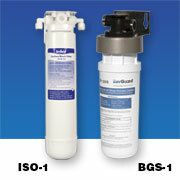 Residential and light commercial reverse osmosis water filtration systems designed to meet today’s high-volume point-of-use needs with high quality and exceptional value. Most models have been independently tested and certified for performance, structural integrity and water quality. 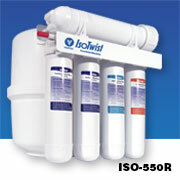 4 or 5-Stage undersink Reverse Osmosis system with 50-GPD Membrane and proprietary twist-off filters optimized to treat city water using the existing water pressure. WQA and IAPMO Certified 4 and 5-Stage undersink Reverse Osmosis system with 36-GPD Membrane optimized to treat city water using the existing water pressure. 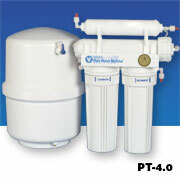 Choose the pump option where water pressure is low or TDS is high. 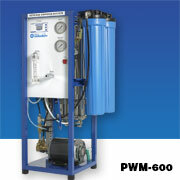 WQA and IAPMO Certified 4 and 5-Stage undersink Reverse Osmosis systems with 50-GPD Membrane make up to 50 gallons of filtered water per day. 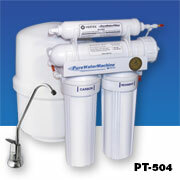 Choose the pump option where water pressure is low or TDS is high. These undersink RO systems use NSF and WQA certified Greenblock filters that are manufactured using a special process that reduces harmful green-house gas emissions. The GreenMachine PT-4G and PT-5G reduces waste-water to the drain by up to 50% and the GreenMachine Supreme PT-4GS and PT-5GS reduces waste water to the drain by up to 85%. 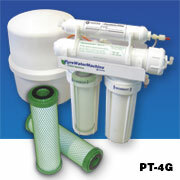 The 75 GPD membrane provides More Clean Water. The 3/8” tubing provides 50% more water flow at the faucet. 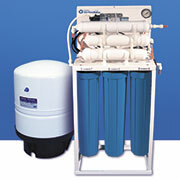 Install 4 or 5-stage RO system anywhere with permeate pump. Use Permeate Pump models where the water pressure is marginal (30-45 psi) and there is no power available for a booster pump. 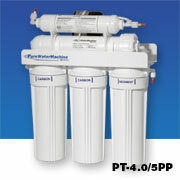 5-Stage Reverse Osmosis Filtration system makes up to 350-GPD using up to four high capacity RO membranes are used to provide the required water rate. A booster pump is provided with the system to produce water pressure of 85 psi to the membranes. 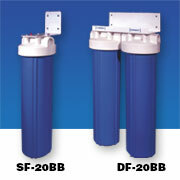 Reverse Osmosis Filtration system makes up to 1800-GPD for whole house supply, water stores, boiler water and process water. Built on a sturdy free-standing powder coated steel frame, these use commercial size RO membranes and are designed to handle up to 2500 ppm TDS. Low-cost 2 and 3-stage standard filtration system fits easily under a kitchen or bathroom sink to provide great tasting drinking water. 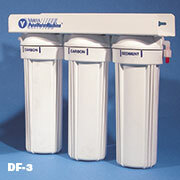 Ensure the safest water with Ultraviolet (UV) light that kills 99.9% of harmful bacteria in filter systems and is FDA approved for disinfecting filtered water. 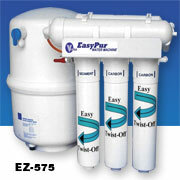 Compact Single-Stage systems that removes sediment, chlorine taste and odor. 2 and 3-stage Point-of-Entry, wall mounted systems with 1” ports and built-in pressure relief valve and mounting bracket.